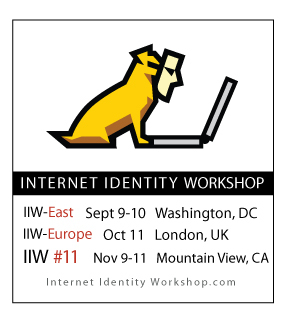 The Tenth Internet Identity Workshop in May, 2010 was the largest ever. We have had inquiries from community members on the East Coast of the US and in Europe have been lobbying us to bring the event to their locations. We are happy to confirm that we are going host IIW’s in Washington, DC and London. WE NEED YOUR HELP! Please take some action if you like IIW and are reading this. IIW is been about the community that attends and participates year round in the activities of groups that use the event to get real work done and move the industry and vision of user-centric identity that works for people forward. So with these events upcoming Phil, Doc and I need your help in spreading the word to your collegues on the East Coast and in Europe who would enjoy the event. To help you do this we have several tools and options. Registration is up here and Early Bird ends August 6th. If you value IIW and the conversations that happen there please take some initiative and reach out to colleagues to spread the word about these events. Because of the community focus of the events we rely strongly on community word of mouth to let people know about them. It would be great to have community ideas put forward for the main IIW invitation articulating the current foci of conversations. It turns out Google I/O is the week of IIW. We found out too late to shift weeks but early enough to shift days to only conflict 1 day (the 19th). Please mark your calendars accordingly. Early Bird Registration is in effect for another month. Sponsorships and “big tickets” (for those who can expense a higher ticket price but can’t get actual “sponsorship budget”) are still available. Regular Registration ENDS NEXT WEDNESDAY – October 28th at Midnight. Prices go up $100 after that. Proposed Topics List is here. We all make the agenda together beginning at 1 on Tuesday and again on Wednesday and Thursday morning. If you want to know more about how to prepare for an unconference check out this piece called “unconferencing” by Kaliya Hamlin (@identitywoman) the facilitator of the workshop. You can see the specific times of sessions. Tuesday Morning Opening talks will cover: * The Identity Trust Framework activities – Drummond Reed and Don Thibeau * Data Portability releasing their EULA work * Action Cards – Phil Windley and Paul Trevithick * Discovery etc. – Eran Hammer-Lahav * Activity Strea.ms etc. – * A VRM update * We might cover activity happening in the healthcare sector * We are working on having Vivek Kundra the CIO of the US join us via skype – as yet this is unconfirmed. They won’t cover – OpenID 101, Information Cards 101 or SAML 101 If you are unfamiliar with these topics we recommend reading these papers/watching these videos. There is a lot of information online covering these topics on the foundations/organizations respective websites. Demo Hour: We still have Demonstration slots available you must sign up ahead of time to Demo. It is Wednesday after lunch short 5min demos will be happening throughout the hour – throughout the room. Please e-mail Kaliya[at]mac.com to get a table and more information about how it will work. Food: I forgot to ask if there were any special dietary requirements. Please let me know if you have any – this is what we have in store for you. If you convene a session it is your responsibility to get a note taker for your session. We will also be collecting a more immediate list of results from each session on 11×17 sheets. We are looking forward to seeing you next Tuesday!